Dana began her passion for quilting in 1994, at first loving hand applique and traditional quilts. In the past few years her quilt designs have been inspired by architecture from her travels. Dana is the owner of Open Heart Quilting Studio and works as a longarm machine quilter. She was featured in the Gammill Machine Company ads for Spring 2014. Dana's quilts have been juried and displayed at The Vermont Quilt Festival, the Houston International Quilt Festival, Road To California, AQS Paducah, AQS Nashville, and The International Quilt Festival of Ireland. Dana taught on The Soul Of A Quilter cruise, and has spoken to guilds about her quilting journey. Her quilt "Cesto Di Fiori" is published in Ricky Tim's Rhapsody book. Her quilts have appeared in Machine Quilting Unlimited, Quiltposium, Quilter's Newsletter, and The Quilt Life. 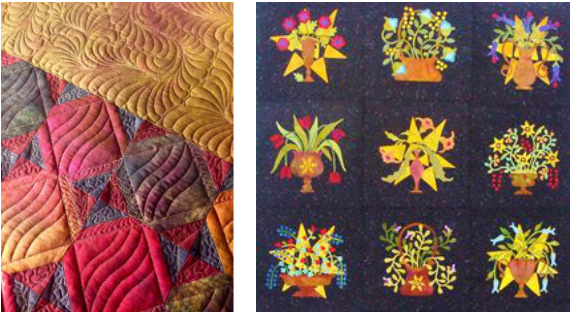 In Dana's classes she will teach machine quilting, showing many ideas for how to fill a space or block with different designs. Her goal is to increase the skill set, and to bring a new level of confidence to the domestic machine quilter. How did you feel about your Innova after you completed your first quilt? "I think the most appropriate word would be THANKFUL. I had a feeling of complete satisfaction even after the first quilt. A feeling of confidence that I had indeed chosen the right machine. I also felt a feeling of thankfulness for having met the people at Accomplish Quilting who went above and beyond to help me every step of the way." Hazel, the longarm, is stitching beautifully. It did so from the first stitch. I do love it already. Thank you Scott for a great installation, and also a huge thank you to Jeff Benedict and Douglas Chapman from Accomplish Quilting for all your help and kindness to me. Even though there is still much work to do in my studio, it seems complete now. I still have my first practice piece on the machine. It feels great to be quilting again after being without a machine for a year.